You'll need some red and white tapered candles. Place the white candles in unpolished or old looking candlesticks (ones that have already burned down a bit are excellent for this purpose. They don't have to be the same size!). Light the red candles and drip the red wax down each of the white tapers so they look as if they are "bleeding." Have a table you are not using for dining? Set the table for the ghosts. Gather all the white, silver, black and orange elements you have. Go crazy...it's Halloween! 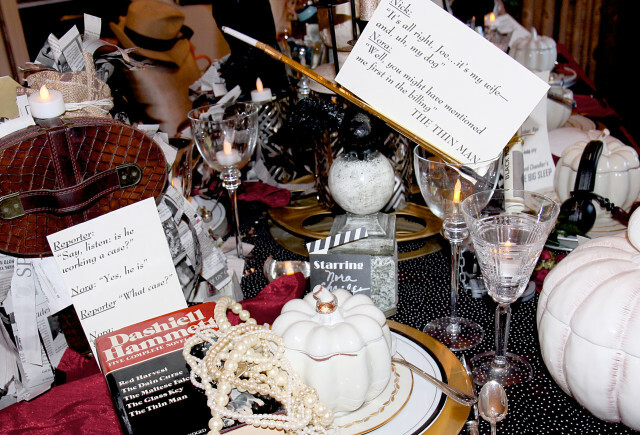 Make placecards for your favorite horror movie characters and embellish with as many props from around the house as you can. Easily found in any decorating or discount store, black ravens are (and should be) everywhere! Buy a quantity of them and place them on top of lampshades, drapery panels and over door frames. Inexpensive black muslin, torn and shredded haphazardly creates a great instant scary effect. Drape it over chairs, tables, buffets and mirrors. Stack dark covered books, and place a skull candle on top of the stack. Add some "bleeding" candlesticks to the scene. Voila!